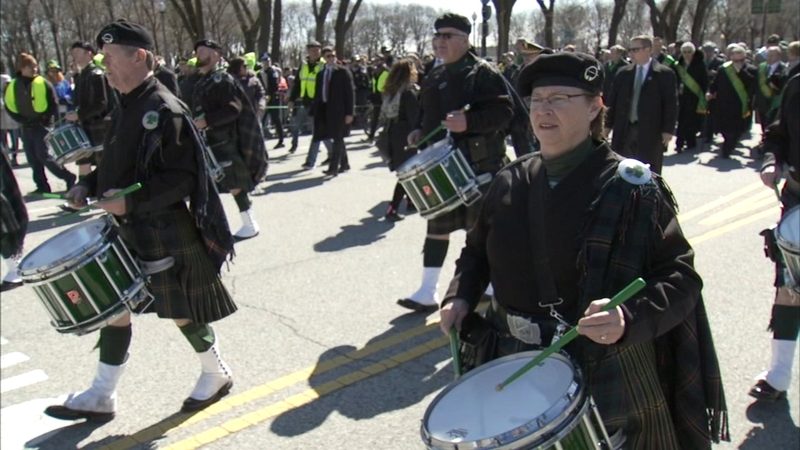 The annual South Side Irish Parade was held Sunday in Chicago's Beverly neighborhood. CHICAGO (WLS) -- A sea of green took over Chicago's neighborhood Sunday with both the South Side Irish Parade, which attracted more than 100,000 people on St. Patrick's Day. The parade kicked off at noon from 103rd and Western Avenue in the Beverly neighborhood and proceeded south down Western Avenue to 115th Street. There was also a marriage proposal. Ryan Blake proposed to his girlfriend Mary Beth Berger, who both grew up in Beverly, during the parade. She said yes. Ryan Blake proposed Sunday to his girlfriend Mary Beth Berger, who both grew up in the Beverly neighborhood, during the South Side Irish Parade in Chicago. Video courtesy of Peggy Salvino. Honor Flight Chicago was the grand marshal this year at the family-friendly event, which drew politicians. St. Patrick's Day celebrations kicked off Saturday morning in Chicago with green dye being spilled into the Chicago River and continued with a St. Patrick's Day parade in the Loop. The parade took a two-year break years ago after rowdy crowds and heavy drinking disrupted the event. When the parade came back, organizers implemented a strict no drinking policy. They still maintain a zero-tolerance policy. Co-chair of the South Side Irish Parade committee, Greg Kovak, spoke with ABC7 about the long-standing tradition of the parade in this community. Security is being stepped up at this year's St. Patrick's Day parade in downtown Chicago. Madeline Mitchell has been crowned "Queen" of the Downtown Parade and she joined ABC7 Friday morning to play some St. Patrick's Day trivia. The Northwest Side Irish Parade also was held Sunday, starting at North Neola Avenue and West Raven Street in the Norwood Park neighborhood.